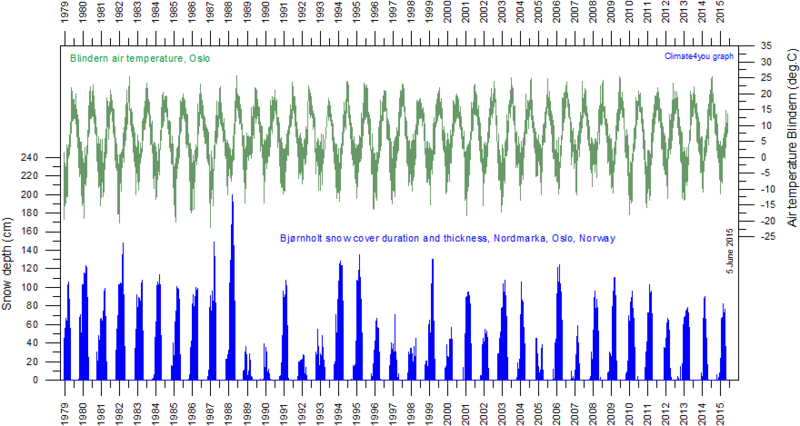 Daily snow cover thickness and -duration (blue) since 1979 at Bjørnholt (60.05°N, 10.69°E, 360 m above sea level.) near Oslo, southern Norway. In the upper part of the diagram the daily average air temperature (green) at Blindern (Oslo) is shown. Last day shown: 5 June 2015. Last diagram update: 6 June 2015. Air temperature remains stable since 1979.